This game is for people who like to upgrade systems. 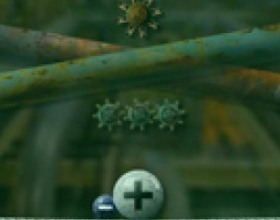 Everything in this game can be upgraded, including Menu Buttons, Game Graphics and more. Use left and right arrow keys or A and D keys to move. 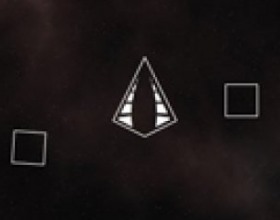 Press the Space to fire. This game looks terrible until you upgrade the graphics. Earth, Global warming, Super spider SpiderX is trying to survive gathering frozen flies for dinner. Move and pull a spider's web using arrow keys or A, S, D keys. Take aim and shoot by means of a mouse. A lot of surprises are waiting for you! This is an old-school top-down arcade space shooter with a fast paced physics twist. Your objective is to stay above the bottom of the screen and get your way through the hoards of asteroids that are trying to bring you down. 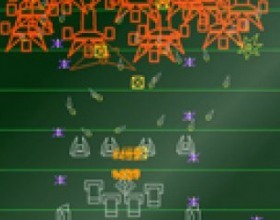 Use the arrow keys or mouse to control your ship and Space to explode, pushing asteroids back. 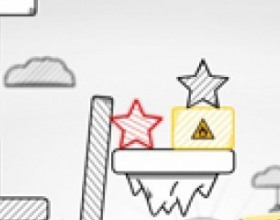 Your goal in this physics based game is to put red star on a platform as fast as You can and with minimal number of clicks. Click the shapes with the mouse to remove them. Be careful - don't let the Redstar fall down from the platform. Use the Space or R key to restart level. 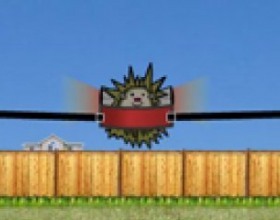 Your objective is to get the hedgehog into space as fast as possible by tactically flinging and flying. Reach for the heavens and make it to space to win the game. Collect cash and hit platforms to earn money for upgrades. Upgrade your stuff between levels. Use mouse to pull back on the launcher, arrow keys left and right to steer. Your task in this game is to slice up shapes while avoiding the balls bouncing around inside of them. Get the shapes down to needed size in the minimum number of cuts. 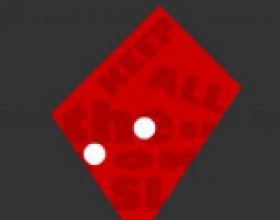 Drag mouse through the shapes to slice them up. If you got hit by the bouncing ball, you have to start over. This game is really addictive. Your mission is to destroy a certain number of polygons in each level to earn a bronze, silver, or gold medal, as well as upgrade points. Check in-game instructions to learn what will each polygon do. Use mouse to click on polygons to activate them. 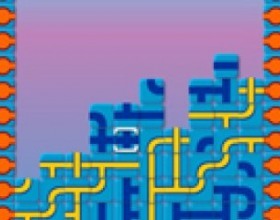 Your task is to evade enemies and solve puzzles by freezing time. Enemies has many different kind of weapons, but you can use your time altering abilities to seek and destroy. Read texts on the screen - they will help You. Use W A S D or arrow keys to move around. Press the Space for tempus. Do You think that all online games is easy? Try this one, and I'm sure You will be surprised how hard is this one. Move Your block from one destination to another. Use arrow keys to move block and avoid other moving objects. If Your screen is moving too, try to play game in full screen mode. 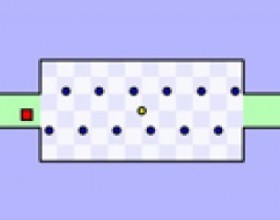 Your task in this game is to collect all blue circles in a level and avoid the yellow circles. After collection the blue circles move your rectangle to the safe area. Use mouse to click and drag the rectangle to move it. 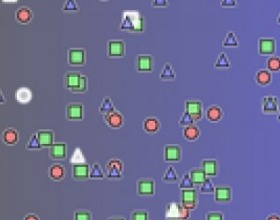 The rectangle is invincible when You don't move it. Really challenging game play. Fresh graphic approach and interesting bonus system will keep you playing. Your task is to move the platform to smash all the blocks with the ball. Move platform with left and right arrows or use mouse. 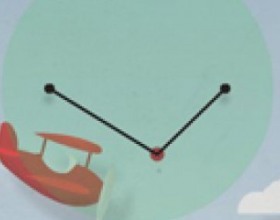 There is also a plane flying over the play field making the game more tricky and exciting. 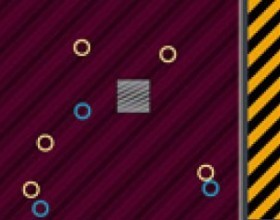 Your goal in this color matching game with some shooter and mouse avoiding elements is to move your Ball and avoid other Balls to survive! You can only bump into other Balls with the same color as the background! Get bonus points for combos. And collect available power-ups. Use mouse to control the ball. Click to drop down a bomb. Our gladiators step out from the arena and set out in a wider and more dangerous world. 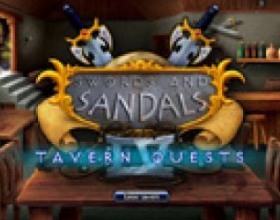 Up to four gladiators compete in a combination of mini games, adventures and battles across mysteries of danger and adventure. Use mouse to control the game. Check out in game Help Guide before You start the game. Your aim is to remove all blocks. Blocks drop when you run over them. Knock them all down to complete the level. Use the left and right arrow keys to move. Press Space to jump or Up arrow key. Your goal is to use Meeblings with special powers to move the other Meeblings to the goal. Use mouse to control the game. For example, Click the yellow Meebling to draw the others in that direction. Red Meeblings burn through soil, purple ones invert gravity etc. 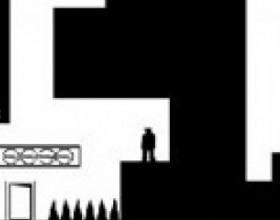 Your goal in this puzzle platform game is to work your way from point A to point B by unlocking gates, manipulating the direction of gravity, and shifting yourself through negative space. 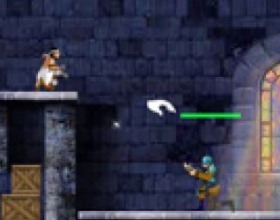 Use arrow keys to move, Space or up arrow to jump. Press Shift to shift, use Ctrl to switch players. Here's 3rd game of Power Pool. 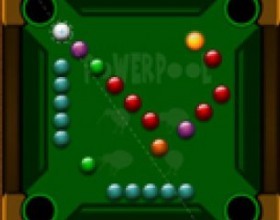 Power Pool Frenzy is ten levels of total chaos, and potentially big, huge and massive scores. Use mouse to click the white ball, hold left mouse button down and drag around to set the power and direction of your shoot, release to hit the ball. 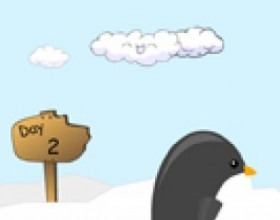 Your goal is to grab your rockets to show that penguins can fly. Hit the water with your belly to bounce back up. Use left and right arrow keys to adjust your angle in the air. Press the Space to use the rockets. Buy upgrades between jumps. At the beginning this will be hard, but you need to buy upgrades to start really flying. Your mission is to decide how to end the world in 2012 with various natural disaster weapons and godly phenomenon. 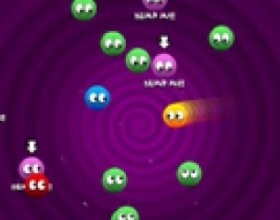 Destroy the various planet zones, accumulate points, unlock weapons and attempt to clear the various achievements. Use mouse to aim and to destroy all buildings. 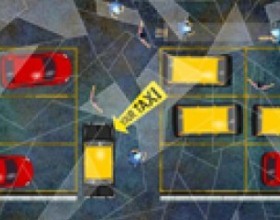 Choose Your Taxi car and park it where big yellow arrow shows You. Avoid any objects and other cars, cause any damage to Your car will end this game. Use Left and Right arrow keys to set direction of Your car. Up and Down arrow keys to move forward and backward. Space to break. Your goal is to catch the Smileys as they are leaving their homes with your Smiley Trap and teleport them to school in time. Match 3 of the same color. 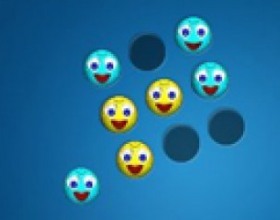 Smileys will get upset when they hit the sides of the board, until they explode. The center of the Smiley Trap is filled in first and whenever it is empty. Use arrows to move the SmileyTrap And use Z and X keys to rotate the Trap. 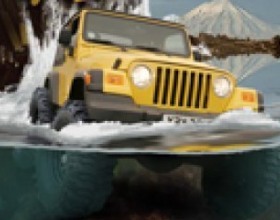 Control the car and try to complete each level as fast as you can without crashing your car. You can collect repair power up to lower your car damage. Collect star bonuses to get extra scores. Use arrow keys to drive Your car! Press Z key for rocket booster and Space to jump. Play this game in FULL SCREEN mode! Also this game requires Flash player 10! If you see only black screen - Upgrade your flash player. The King has ordered you to crush all resistance in order for his kingdom to survive. 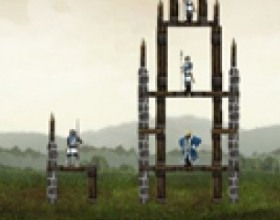 Your objective in this castle demolition game is to crush castle after castle by wiping out all of it's people with a powerful slingshot and an arsenal of 8 different charges. Use the arrows to view the castle. Use Mouse and Space to fire, release and reload. Your aim is to shot balls and hit all targets to pass to next level. Use Mouse to click and hold down the sling shot. Drag to pull it back to give it a power and then release to shoot. 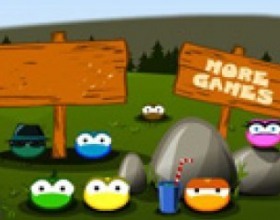 Number of balls is limited, if you run out it is game over. Sometimes there are obstacles, you must use the walls to to bounce your ball to hit the targets. 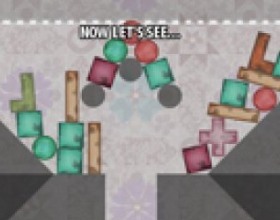 In this game there are 40 easy balance physics puzzles. This game is for those who find the other Perfect Balance games too difficult. Use A and D keys to rotate shapes and use mouse for all other actions. After all shapes are placed - wait few seconds for perfect balance. Your goal in this game is to group 4 balls of the same color and explode a plate. Explode all plates in a level to pass it. Use mouse to click on the plates to turn them around and click on the balls to throw them onto the rails. 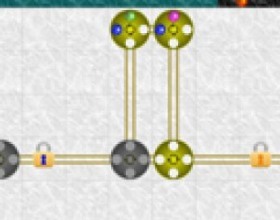 The balls may go over one another within the rails. 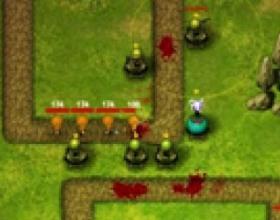 Your mission is to place battle soldiers in strategic locations as you prepare to take out incoming waves of enemies. Upgrade your defense towers as soon as you can for a chance of survival. Use mouse to select and place units. There are also hot keys (see game instructions). 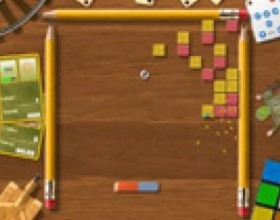 Your aim is to destroy a different number of blocks to complete each level. You destroy blocks by creating a complete path between the wires in the blocks and 2 power nodes at the edge of the screen. Destroy more blocks at once to get more points. Use arrow keys to move the cursor and press Space to rotate the blocks. Your task is to destroy all of the positive and negative particle balls on each level. Place the particle balls above the line and press play to let physics do it's work. Balls of opposite polarity destroy each other. 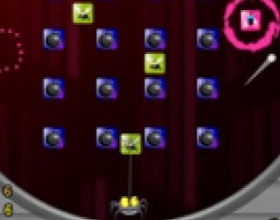 To clear the level there should be no particle balls remaining. Use mouse to control the game and begin Your adventure.